AllSeated is key to professional event planning success. AllSeated’s online network for planning events is the key to your professional event planning success. Organize, manage and collaborate on all aspects of your professional event planning. Keep vendors and colleagues who are working on your event up to date on all important planning details in real time. Work together on building the guest list, floorplan layout, seating arrangements, timelines and more! Manage your event’s guest list within your AllSeated account. Guest names and mailing addresses can be organized alphabetically and even filtered into specific categories based upon your event’s needs. Enter names manually or easily import from Facebook or Excel. You can manage your guest list down to the very last detail, whether it is an internal corporate event or external corporate event. Your guest list can be organized by company, department, region, and job title with the option to include specific details relevant to the event such as speaker information and award recipients. Within your guest list, you can also keep notes, enter meal type information and track your event RSVP’s too! Easily design your floorplan layout to scale within your AllSeated account. Using AllSeated’s vast furniture library, select the tables, furniture and objects to create the specified floorplan layout for your event. 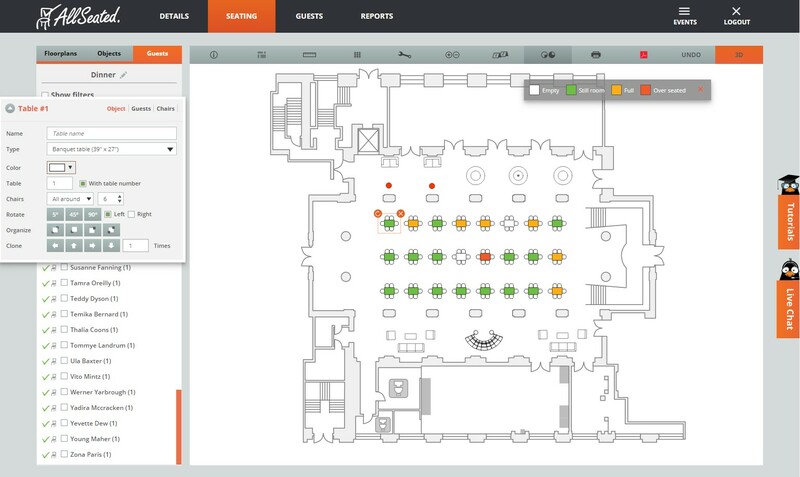 AllSeated’s floorplan tools allow you to customize the spacing between tables, number of chairs around each table, table numbers, and table assignments. All of these details can be modified at any time with just a few clicks! As you design your floorplan layout, feel free to switch views from 2D to 3D to take a tour of your floorplan.AllSeated’s 3D allows you to create a virtual walk through of your event at anytime during your professional event planning process. 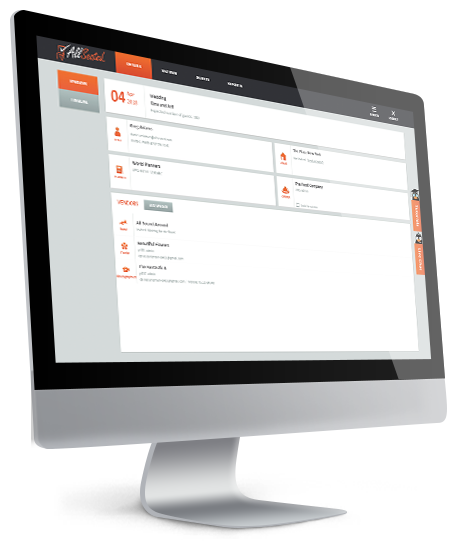 Your guest list will link to your seating arrangements allowing you to easily create your event seating chart..AllSeated provides you the opportunity to seat your guests at tables with the option to assign individual seat assignments at each table if desired. It’s easy to play around and move guests from table to table until you find the seating chart style you love! Using AllSeated’s Virtual Reality tool, experience the event before it even happens. AllSeated’s special virtual reality goggles allow you to tour your future event layout in a realistic simulation. Learn more about AllSeated’s Virtual Reality and the three easy steps for getting started here. Generate useful reports which can be filtered to meet many of your corporate event planning needs. Easily generate a floorplan report to detail your specific layout along with complete listing of inventory, table breakdown and seating information. A guest report can also be generated to include details such as meal types, table numbers and any other information relevant for the venue/caterer. A guest list report can also be generated for the calligrapher for invitations, place cards and even for personalized favors. AllSeated provides you the easiest and most effective way to collaborate with your vendors throughout your planning process. Invite colleagues and vendor partners to collaborate on the event to work together on tasks such as guest list, floorplan, timeline and seating arrangements. Vendor collaboration within a vendor timeline will keep everyone working your event updated in real time as well as help to convey the flow of set up, event details and the timing of break down at the end of the event. AllSeated’s Day-Of Mobile App gives you access to your event on the go with a full check-in system including real-time collaboration, live check-in updates, overview of check-in status and ability to view your floorplans in both 2D and 3D. The day-of Mobile App also allows you to let your guests know where they are sitting while also keeping track of who is in attendance, and who is unaccounted for. The Day Of Mobile app also gives you direct access to your master seating chart.